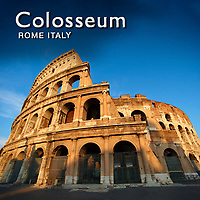 Started in 72 AD at the order of emperor Vespasian, the Colosseum was completed by Titus in 80 AD. At the inaugural games over 9.000 animals were killed which set the benchmark for future events to beat. In 106 Emperor Trajan celebrated his conquest of Dacia (Romania) with 123 days of games involving 10,000 animals and 11,000 gladiators. Elaborate sets were built in which hunters stalked exotic animals like Lions & Tigers from Africa or bears from Europe. Before each games condemned prisoners were executed for the entertainment of the crowd. In 303 AD the first Christians joined the condemned in the Colosseum and were executed. Emperor Diocletian, who had aligned himself with Jupiter and the old Olympian Gods, decided that the Christians were making the old Gods angry with their worship of just one true God. He ordered everyone in the Empire to make sacrifice to the old pagan Gods, if they did not do so they were obviously Christian and were sentenced to death. Christians were literally fed to the Lions in the Colosseum in a brutal martyrdom. These horrific scenes did not excite the crowd much though as the Christian simply knelt in prayer and accepted their fate with quiet dignity believing that, as martyrs, they were going to heaven. The crowd could not see why pious Christians who had spent their lives doing good deeds were being executed. By 311 Christian sympathy had grown to such an extent that the Christian persecutions were stopped and the new emperor, Constantine, made Christianity an official religion of the Roman Empire. Gladiators are synonymous with the Colosseum. They were trained at great expense and there was great rivalry between the Gladiatorial schools. Gladiators were made up of slaves, ex soldiers or prisoner of war looking for wealth and freedom. The Roman Nobility financed the Gladiatorial games to show off their wealth and power. Gladiators could win riches and fame if they were successful and eventually but their freedom. Records show that retired gladiators talked of their defeats as well as wins which shows that not all fights were to the death, as Gladiators were far too valuable for their owners to waste needlessly.